Each level presents a new layout of breakable blocks and different colored gems in which innocent creatures are trapped. 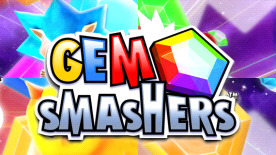 In order to smash open a gem, the colliding character must be of the same color as the gem. Our little friends can change their color by using the magical color-changes scattered around. Colorful graphics and special effects. Keyboard, gamepad & mouse control.